30 Days of Biking has officially begun! I woke up a little before 6am and after checking the weather I had a decision to make. Should I go on a bike ride to watch the sunrise while the temperature was at 15 degrees or should I wait until late morning when above freezing temperatures were predicted? I decided to be a wimp and wait for the sun to warm things up a bit. A bit is right because the temperature choose to only get up to 24 degrees. Oh well, better cool than scorching hot. I was eager to rid myself of my jacket, however, so I chose a road that climbed a plateau. Once my body warmed up I shed the jacket, excited to feel the cool air sweep over my bare arms. Yeah, it stung a little and my arms soon reddened from the chill but it was so worth it. The road I was on was new to me and all of a sudden I found myself in a large barnyard, wondering if I had come to the end of the road. Then I saw it. A snow covered path that went beyond the end of the pavement. I yelped with joy. Winter hadn’t surrendered completely yet. I love winter. I really love winter. The snow was perfect. Hard enough so that I didn’t sink like a rock and soft enough to give me the “plowing through snow” feeling that I love. My grin was so wide that I am surprised my teeth didn’t fall out. Then I felt a quiet whisper, “Are you having fun yet?”. In times like these I feel God’s presence in such an overwhelming way that I don’t know if I should shout the glory of it or weep from joy. I ended up doing a mixture of both. I saw all sorts of animal tracks. Do turkeys eat cockleburs? Because the evidence I saw today sure made it seem that way. Tough stomached birds. After a while the snow became too soft and I turned back. When I did the entirety of the river valley was spread out before me framed by the Adirondacks. Once I regained the pavement I flew down that road (after replacing my jacket of course) laughing. I met up with the main road and I had to ask myself the all-important question, to continue or go home. Too pumped to turn back I choose a different road to climb the same plateau again. 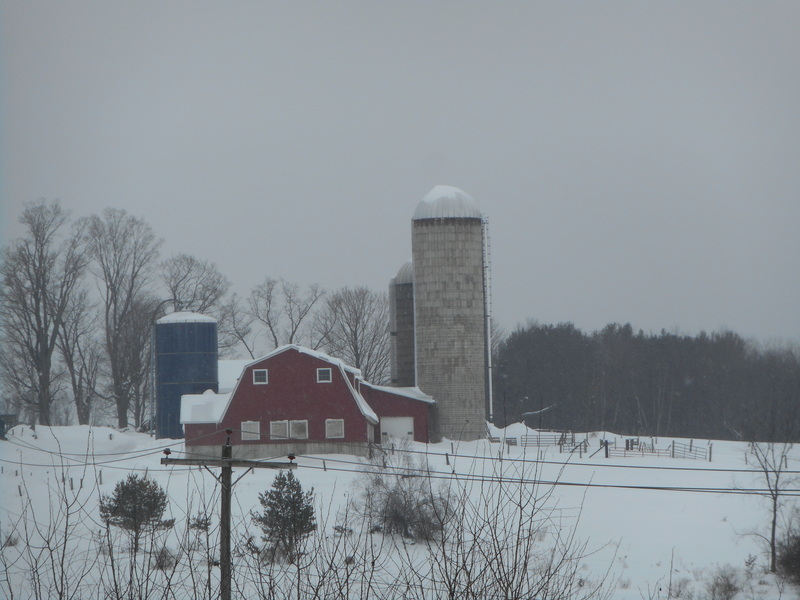 There were signs of spring everywhere; robins, trees tapped for sap and bare patches of earth. But more than that spring was in me. In my legs. In my heart. Deep down in my soul. For the entirety of the ride home I could not wipe the dopey grin off of my face. How could I? 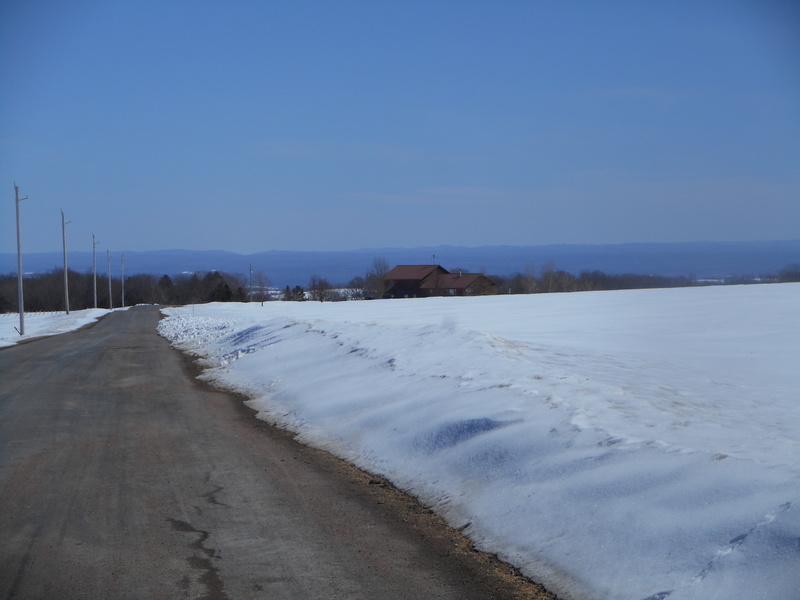 I had just experienced the delight of winter and spring in one glorious ride. 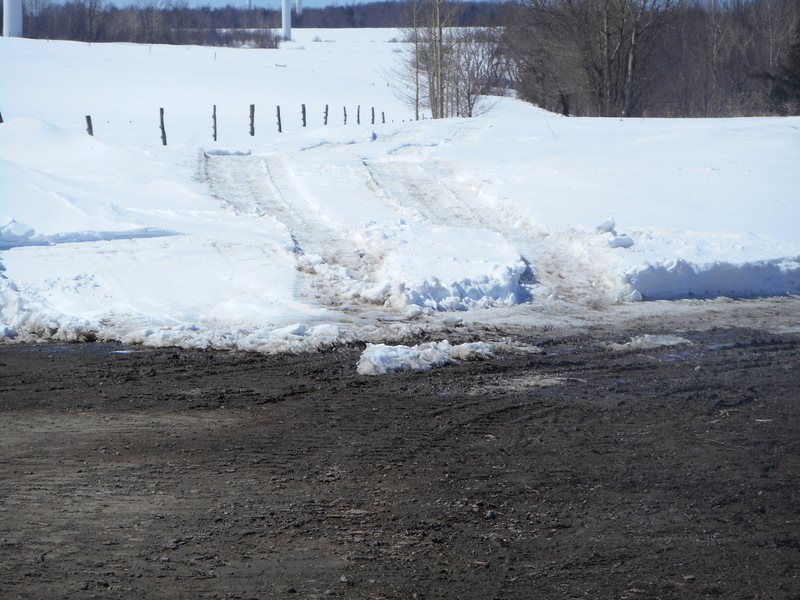 Yesterday on my ride home I noticed that the snowmobile trail which intersects the road I was biking on had thawed and turned very muddy. That got the wheels in my mind turning. 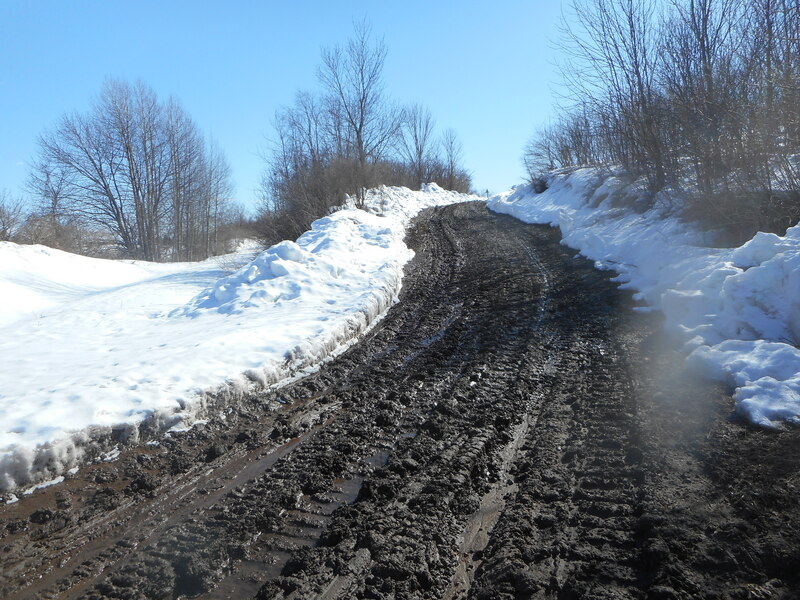 Mud would make the trail impassable for snowmobiles, the obvious conclusion being that it was time to turn the trail into a designated bicycle path. My lens got a bit of mud on it, oops. So today I veered off the shoulder of the road and into the mud. It is always fun to get off the road and head for the hills. 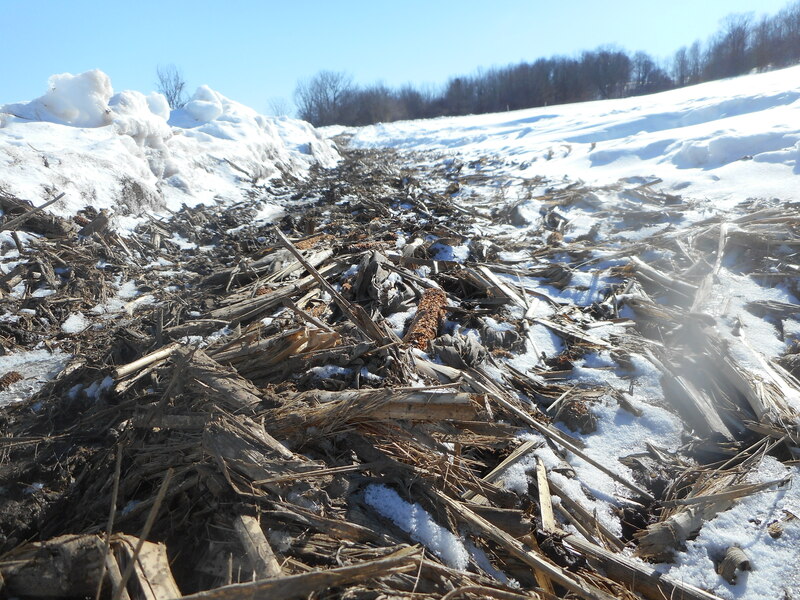 But when I crested the hill and went around a bend the mud was replaced by a layer of corn stalks, husks and cobs. I had never biked over corn paraphernalia before and quickly discovered that it is super bumpy. More like jarring. 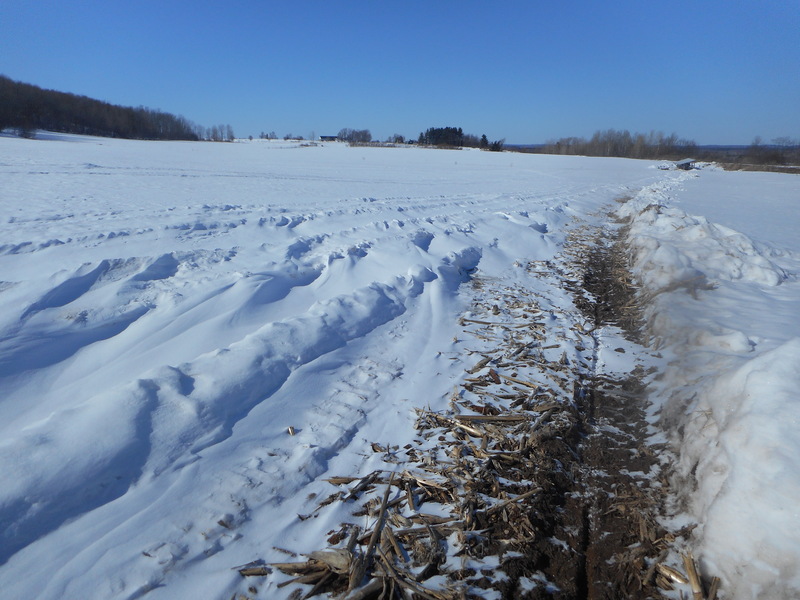 I began to follow this trail of corncobs and was led into an open field where the wind had blown powdery snow into the ruts of the trail. 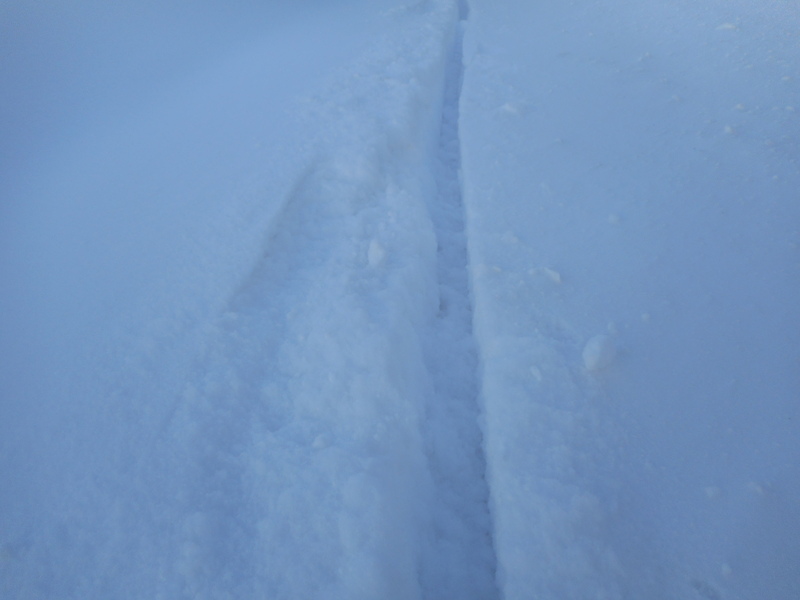 Ruts filled with glorious powdery snow. All I can say is, my bike handling skills have really improved over the winter. 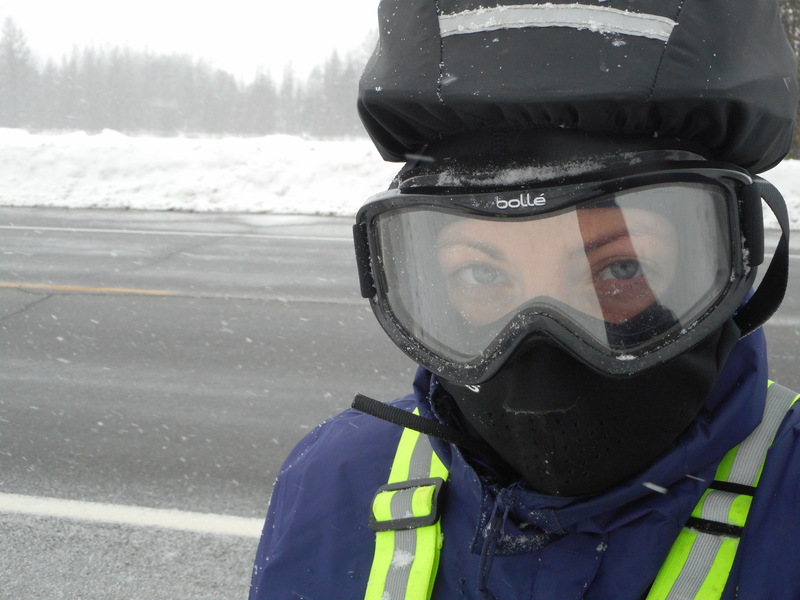 Even though I was biking through snow over a bumpy surface that I couldn’t see or predict, I was able to stay upright. 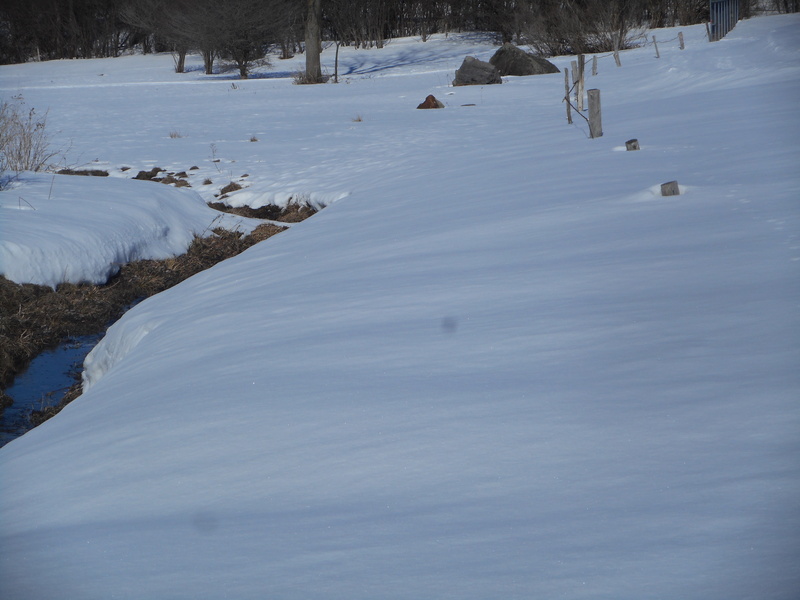 I crossed the field successfully and then began to traverse a section of hardened snow. 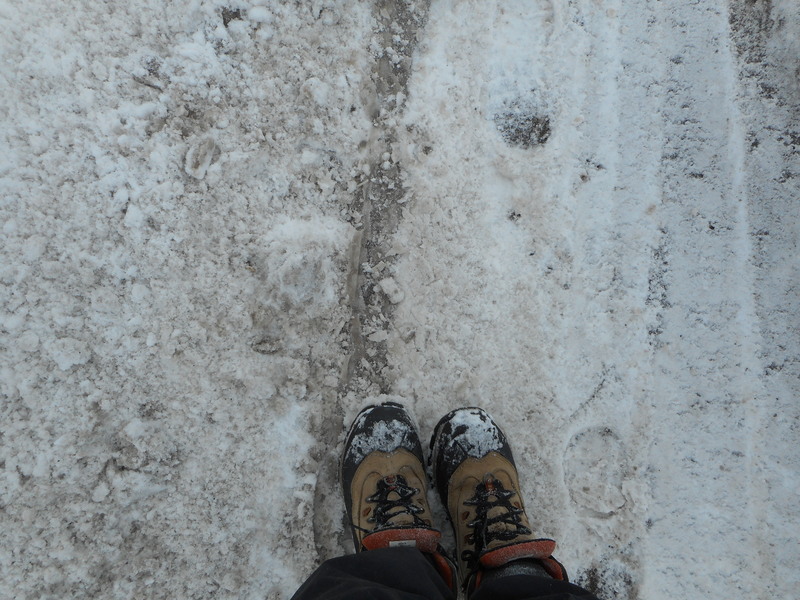 While crossing a small stream that was underneath a thick cover of snow, one of my legs plunged into the snow and my boot got stuck. After making it over the stream I was able to bike on top of the snow. 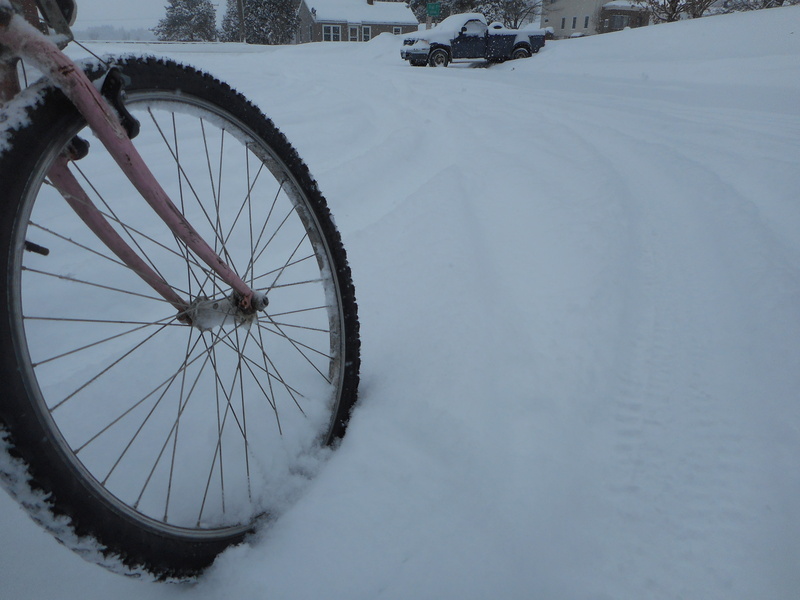 But every little while the rear tire would sink deep into snow and need to be rescued. Then me and my bike came to a barbed wire fence. The trick was that the fence was hidden under the snow where we crossing. I got off the bike to walk over the fence, knowing that if I was super unlucky my leg could plunge into soft snow right where the barbs would scratch it. But today wasn’t my super unlucky day and the snow held until we made it over the fence. You can see part of the fence here, a few posts are barely sticking out over the top of the snow before the whole thing disappears under the snow. 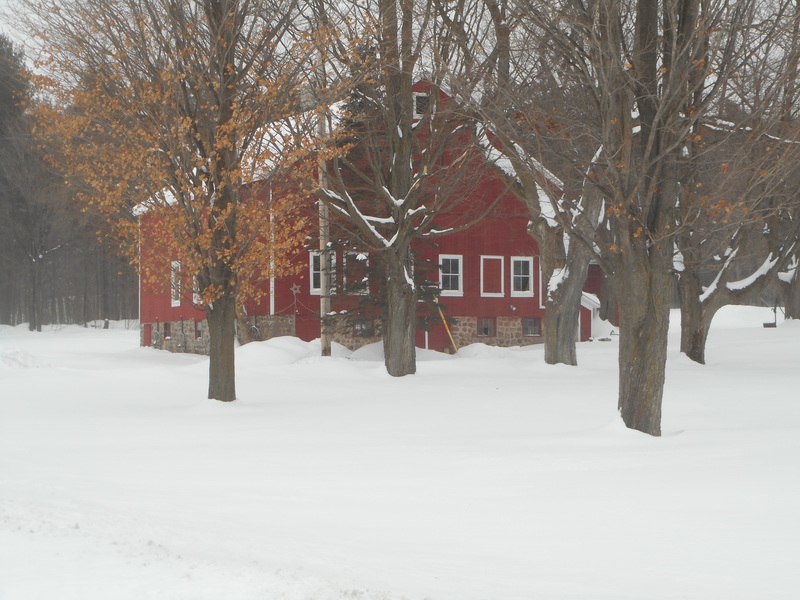 A few hundred yards of hardened snow later, we came into the fairgrounds and headed home. Can’t wait for Monday. As I started my ride I was awestruck by the beauty around me. The snowy landscape was gleaming from the light of a full moon making it the brightest morning I’ve experienced so far this winter. Two deer crossed the road underneath the moon night and I drew in a deep, contented breath, knowing this was going to be a peaceful, beautiful bike ride through the snow. I had just descended the hill coming out of town, when my bike decided to revolt. My bike and I have come to a mutual agreement about subzero rides. As long as I keep pedaling constantly, my bike will be nice to me. But if I coast at all, my bike does have the right to let the chain slip, which I then have to adjust before moving on. But this morning my bike was having none of our little contract. 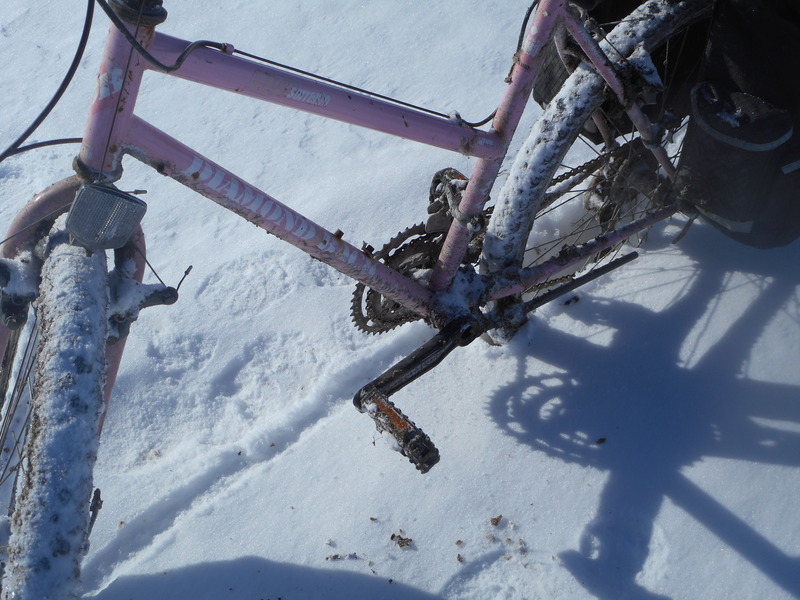 The chain was slipping over and off of the gears, while I was pedaling. Not cool. Maybe I could lower the seat and use the bike as a scooter? Nope, the seat would not budge. 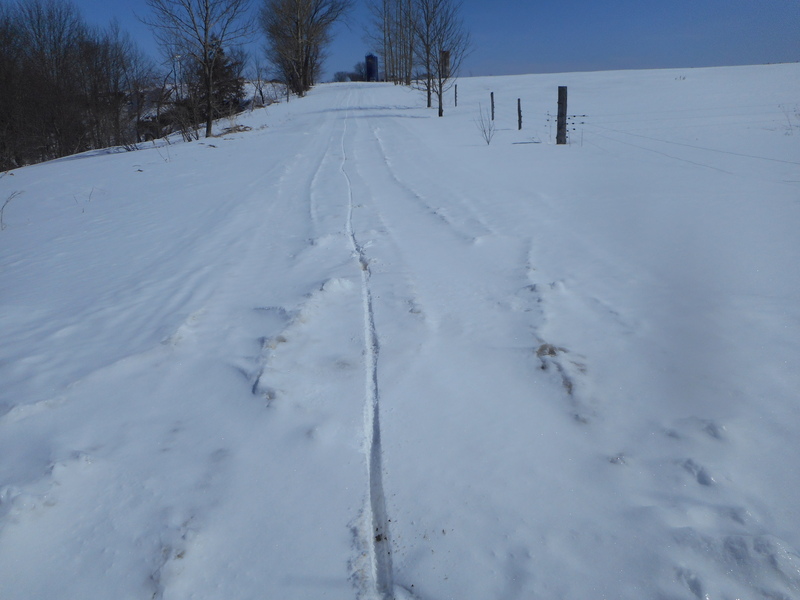 Then I discovered that while sitting on the saddle I could kick the snow bank on the edge of the road with my right foot and propel myself forward. This proved effective as well as strenuous. I took breaks from bike-scooter-ing by jogging alongside my bike. It felt like a bizarre workout; push my bike along until my leg was on fire, then run until I was out of breath, repeat. In the interest of staying warm and with the thought that there was a chance I could still magically make it to work without the need for rescue, I continued my scooter/jog routine. I was disappointed with my inability to make it to work on my own, but the irony of the situation began to amuse me. -When I started using my bike as a form of transportation a few years ago, most days I rode while secretly hopeing that someone would offer me a ride. If the weather was the least bit nasty (rain or wind, horrors!) I would be glad to use it as an excuse not to bike. But here I was in out in -16F, desperately trying to make it to work somehow. 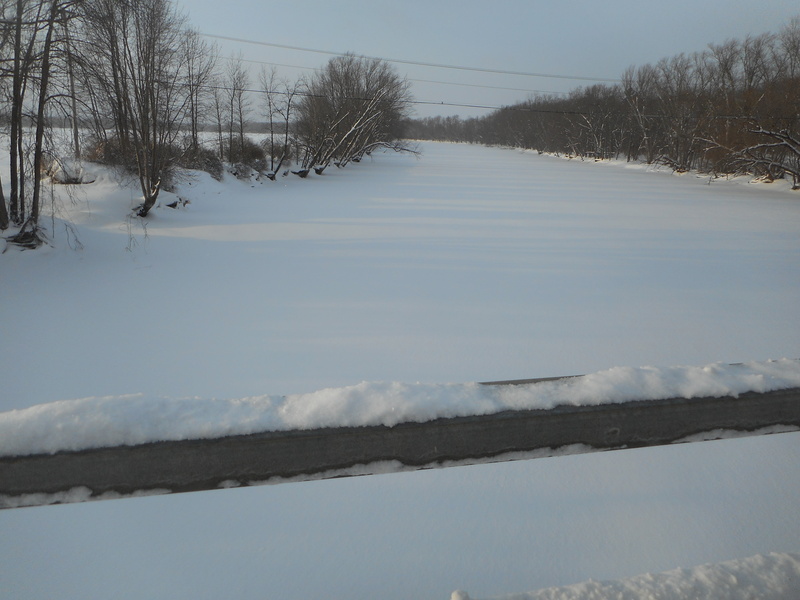 -I was apprehensive about many aspects of year-round biking when winter began. The cold was not one of them, I knew I could handle subzero temps no problem. But the cold has turned out to be my bike’s arch nemesis. -I was able to complete every commute in November, December, January and February. The first week of March is a different story. 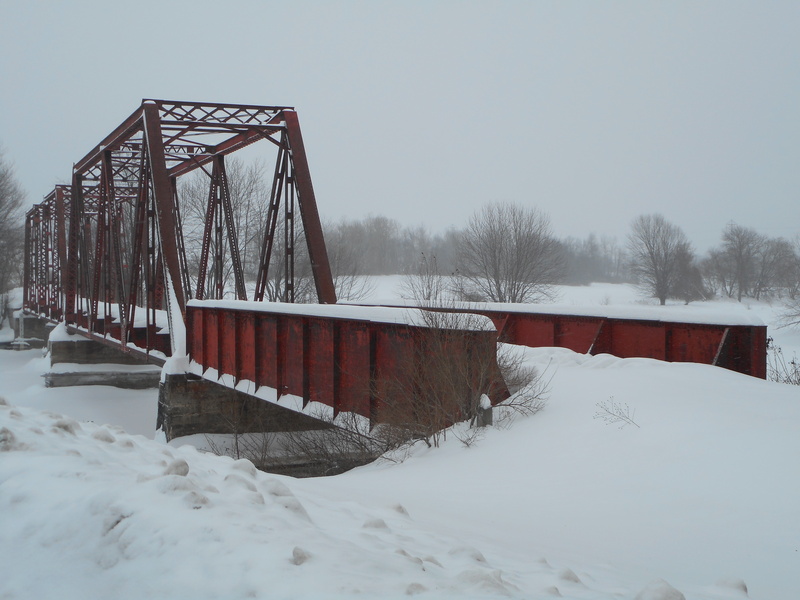 -My dad and I were talking last night and he made the comment, “This could be the last time we get below zero temperatures this winter.” I expressed that I would miss them and that I was glad I had learned how to bike successfully in them. Oops. All these things flashed through my mind and I had to laugh at the extreme irony of my morning. But when I looked to the sky, I realized the moon had been laughing at me the entire time. Comments: Who knew bike-scooter-ing is actually a really good way to stay warm? Comments: Sure, my face got a little cold, but it feels like spring! 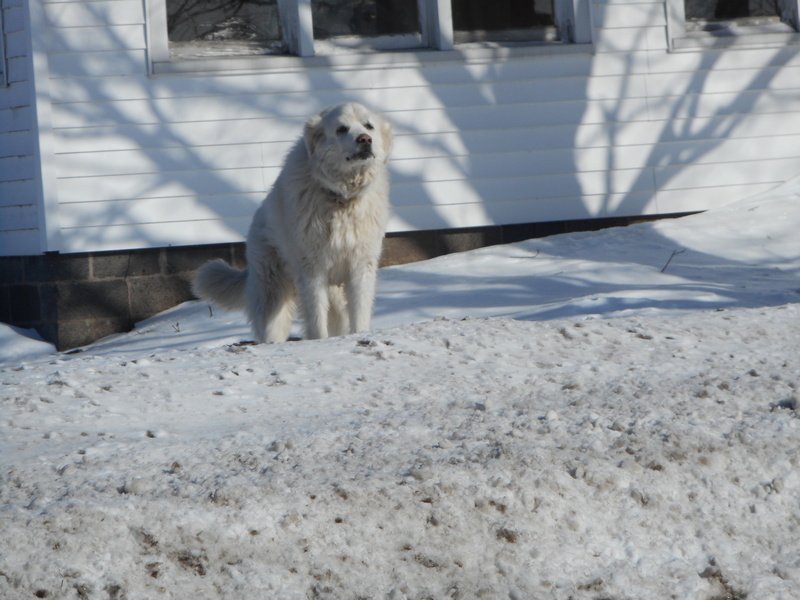 The giant white dog makes a cameo! That awkward moment when you have to tell a tree that autumn is over. On the way to work my chain was behaving strangely again so I pulled over to take a look and found that the derailleur pulley (I think that is what it is called) was not moving freely. When I got to work I sprayed some WD-40 on it and that seemed to ease the problem on the way home. I look at it again tomorrow. The sky was dropping huge flakes of snow on the way home, totally beautiful. I will never get over the stillness and peace of biking in a heavy snowfall, it feels special every time. I brought along my cheap Wal-Mart headlight with me this morning in case my headlight died which it did but I was so close to work that I didn’t bother to stop and mount the Wal-Mart light. Good news though, I contacted Light & Motion on Monday night and they shipped a new light out for me on Tuesday and it should be here any day now. They are letting me keep my old light as well, which is awesome. 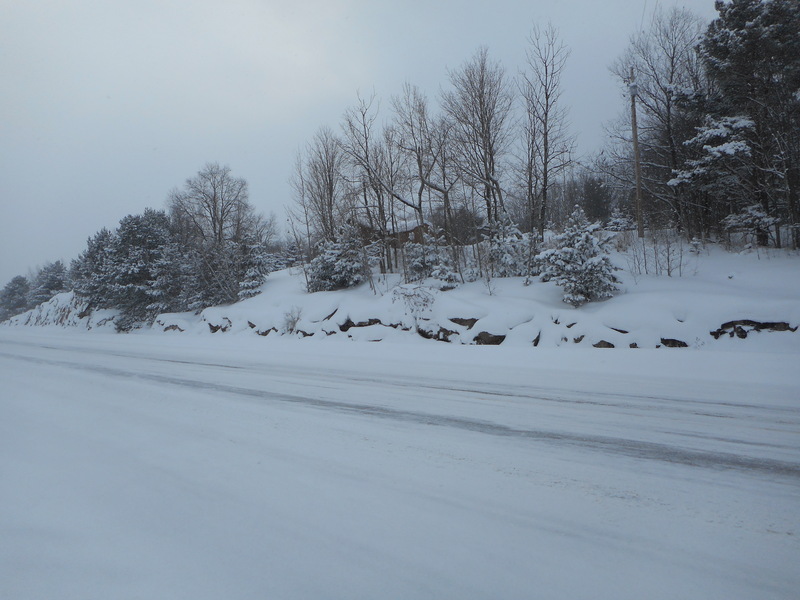 The commute started out with clear roads, light snow, good visibility and high psi in my tires. But my journey did not stay so tranquil for long. 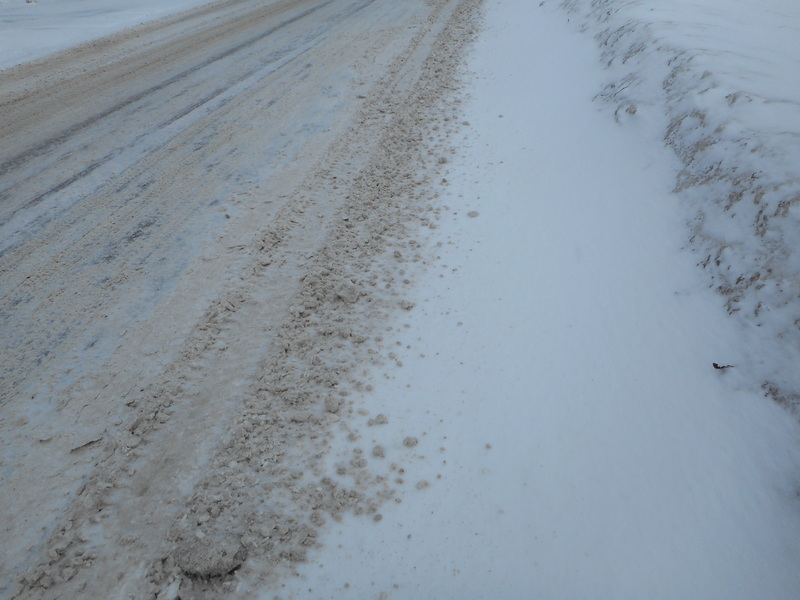 The snow was soon falling so thickly that right after cars passed me they would seem to disappear in a cloud of snow. I will never understand why a small but significant percentage of drivers refuse to turn on their lights except when they turn on automatically at night. Just because you are in a car doesn’t mean people can see you. I hold no such misconceptions, I always assume that cars do not see me and I try to remember to behave accordingly. I lowered my tire pressure so that I could ride at the very edge of the shoulder. Gotta love my tires, when the pressure is low they stick to the road even when the nastiest, brown-est snow comes their way. However, the increased traction means I have to work extra hard in the saddle, so I am currently a tired little bunny. Comments: Got pretty warm, but it wasn’t too bad. I had the best ride home ever! I woke up at 2:30 to several inches of fresh snow with more gently falling. I rode to work and the snow continued to fall. I worked through the morning and the snow continued to fall. I worked through lunchtime and the snow continued to fall. I got back on the road and guess what? 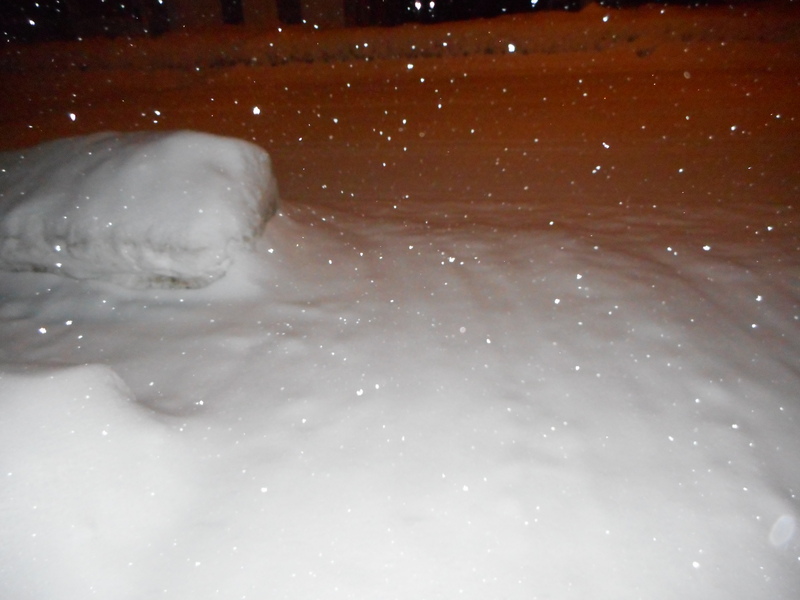 The snow continued to fall. 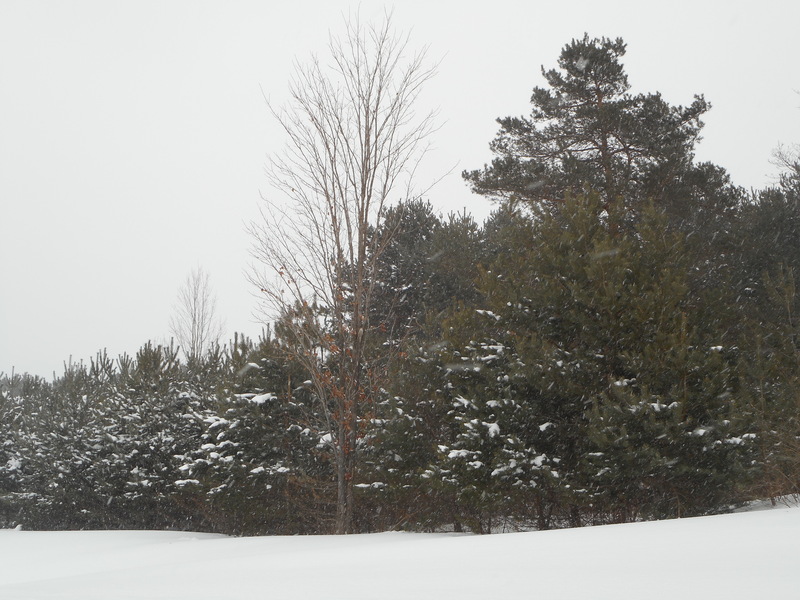 It wasn’t a heavy snow, just a steady downward float of the fluffiest, lightest snowflakes imaginable. In all we got 15 inches. 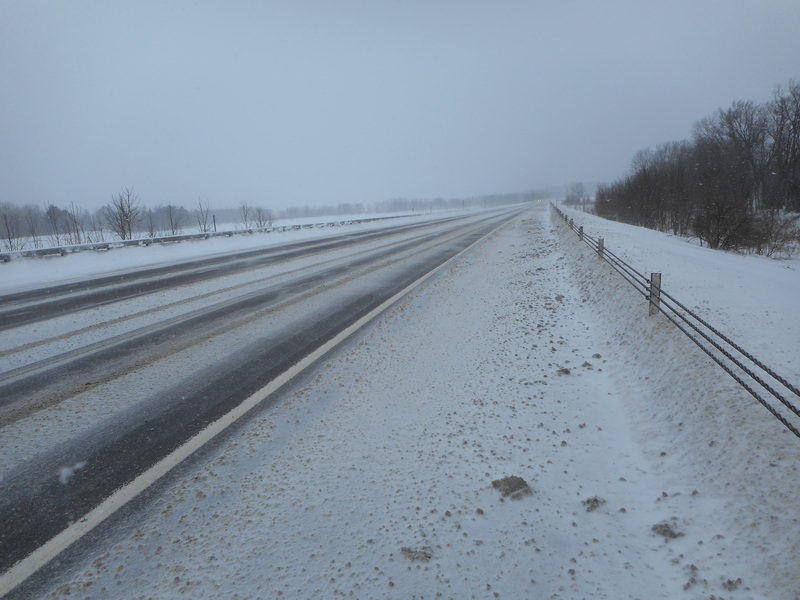 Visibility on the road wasn’t stellar at first so I plodded along in the several inch deep snow of the shoulder. Sure, it was slow but I felt safer there and going through snow is more interesting than using the plowed road. About halfway home the snow stopped and the sun came out. There was a hint of a rainbow in the sky. I was having a nice ride and enjoying the landscape until my world was forever changed. By snow dunes. Snow dunes are little magical piles of snow crafted by wind blowing over open fields. The conditions we had today created beautiful deep snow dunes. I found out what my natural reaction is to seeing snow dunes on the shoulder on the road. I want to destroy them. I went charging through those wind-shaped piles of snow as fast as I could (which was not really that fast). Oh my! Why use artificial snow on ski slopes when the snow would be of greater use making snow dunes for bike riders? I kept finding myself giggling while flying through the mounds of snow. I was chugging right along when I suddenly realized that I should try to take some pictures. I took off my gloves and got out the camera. While I was fishing around in my panniers to find something to use as a reference point for the picture, I saw a snow plow in the distance. Oh great. So I snapped a picture quickly, grabbed all my stuff and dragged my bike to the other side on the road. 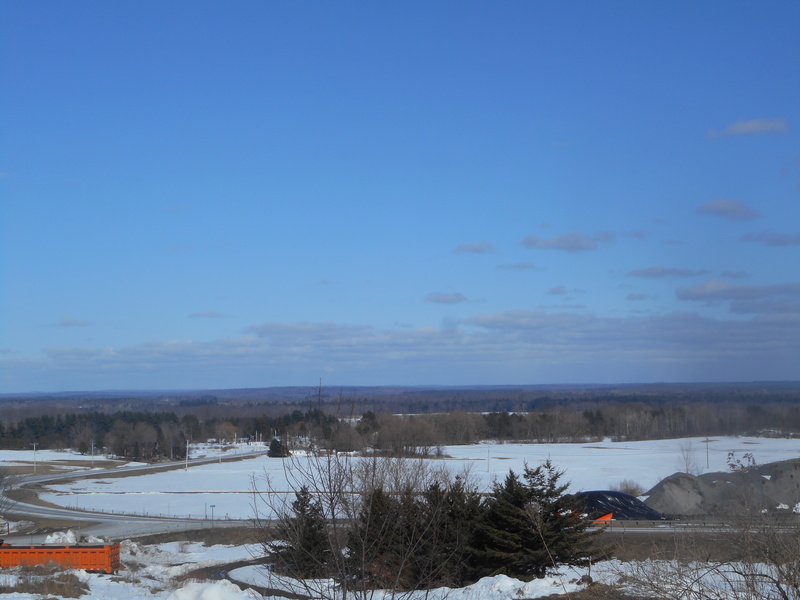 The picture I took just before the snowplow destroyed all traces of snow dune existence. If I thought I was good at destroying snow dunes I quickly found out that snow plows are weapons of mass destruction, destroying entire communities of snow dunes in their wake. 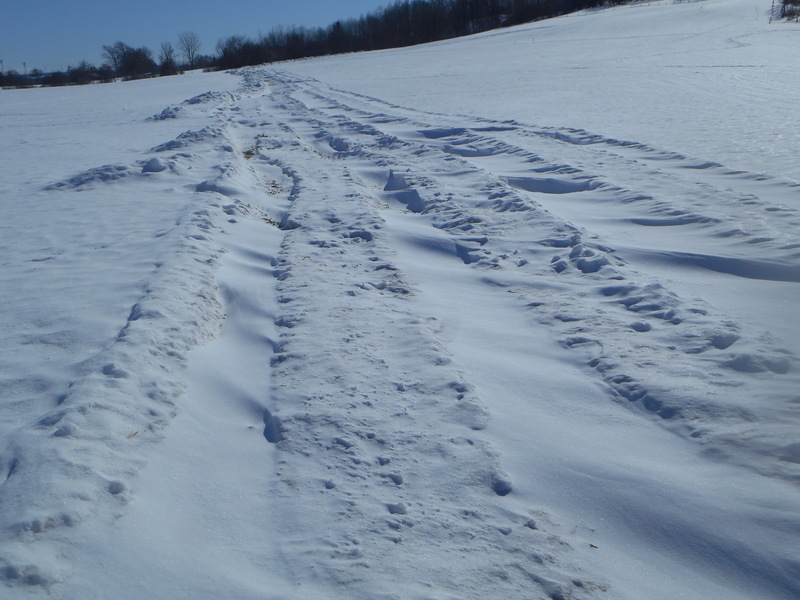 I re-crossed the road and all my fun had been plowed away. But it was awesome fun until then and a great workout as well! Comments: My legs have been staying warm lately which is really nice of them. Comments: I should have worn my headband as well, my ears got a little cold and currently feel sore. Main road on the commute to work. I worked the later shift today so I got to sleep in! But the downside is I had to work later than I am used to working so I was tired by the end of my shift. The last hour at work was a rush, I tried to get everything done as fast as possible so that I could head home. As soon as hopped on my bike and started out under the clear, glittering sky I could relax and breathe again. I love biking at night, especially when stars and moon light the way. I was climbing a hill when I noticed a car stuck in a snow bank, hopelessly spinning its wheels. The rear of the vehicle was jutting out into the road and as a car whizzed by it honked angrily at the obstacle. A few other cars also passed by, heedless to their fellow vehicle’s predicament. Shouldn’t vehicles be ready to assist their own kind? Side road on the way to work. I was slightly cautious while approaching the car. I instinctively fear sports cars that are revving their engines. But a breathed a sigh of relief when I could see that the driver was an anxious young lady. She rolled down the passenger window and accepted my offer of help. After a childhood filled with pushing a 15 passenger van out of snow banks, helping a little sports car was a piece of cake. The driver thanked me and drove off. Nothing else exciting happened on the way home so I got to thinking and decided there are at least four reasons why winter cyclists are a better option than the typical motorist for rescuing stuck cars. 1. We are dressed for success. People in cars often are only dressed to sit in a heated car, not push cars out of snow. But winter bikers? We have our boots, hats, balaclavas and layers on, we are prepared to be in the snow and cold (because we are in the snow and cold). 2. We are more observant of the helpless cars around us. Vehicles may miss out on a car in distress due to their great speed, but us slow and steady bikers won’t miss a thing. 3. Bikes are non-obstructive. When a motorist rescues another motorist they must first find a safe place to park their vehicle so it will not obstruct traffic, something that can be tricky in winter time. 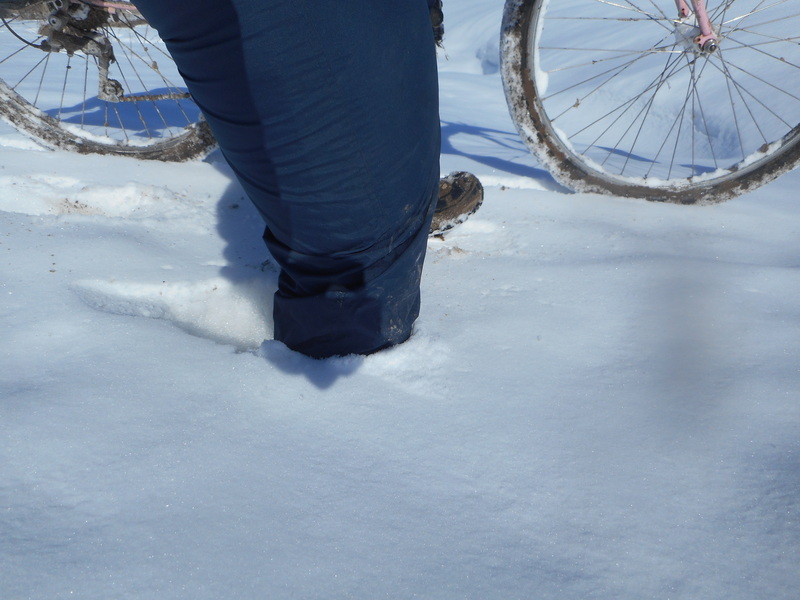 But when you are on a bike you can just pick it up and stash in the nearest snow bank if need be. 4. Our strong legs come in handy when pushing out a trapped car. And think of the benefits to the cycling community, I doubt that girl will tell the next biker she sees, “GET OFF THE ROAD!! !” So let’s rescue all the cars we can, they need our help. This highly sophisticated design, which utilized a knit glove secured with electrical tape proved unsuccessful. 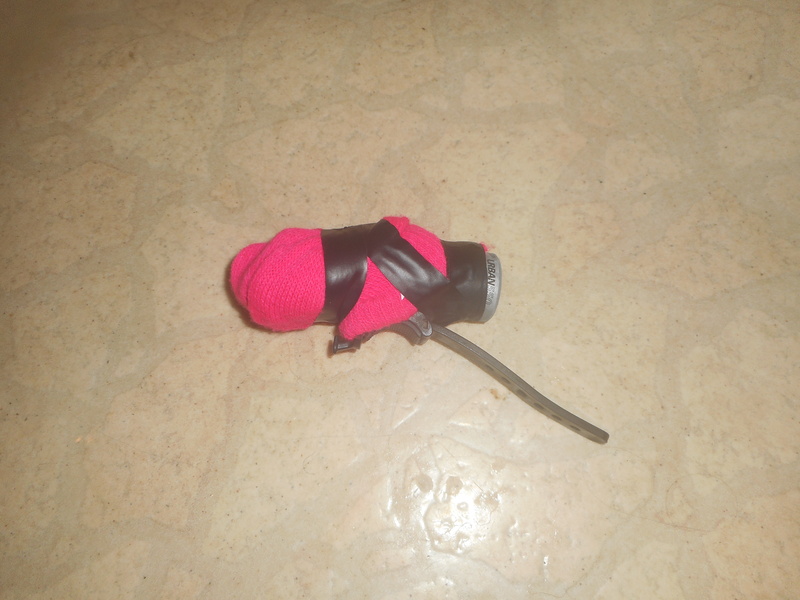 On a sad note, my first prototype of the highly anticipated insulated bike headlight failed. My light did last until I arrived at home but the temperature wasn’t severely subzero either. Back to the drawing board.